Editor's note: You'll find a text version of this story below the video. Welcome to Chart of the Day. Here we see a weekly chart of two indexes, which represent two strongly-related sectors in the financial industry -- namely banking and hedge funds. The KBW Bank Index includes the "money center" and large regional banks, while the HFRX Global Hedge Fund Index shows the overall composition of the hedge fund universe. 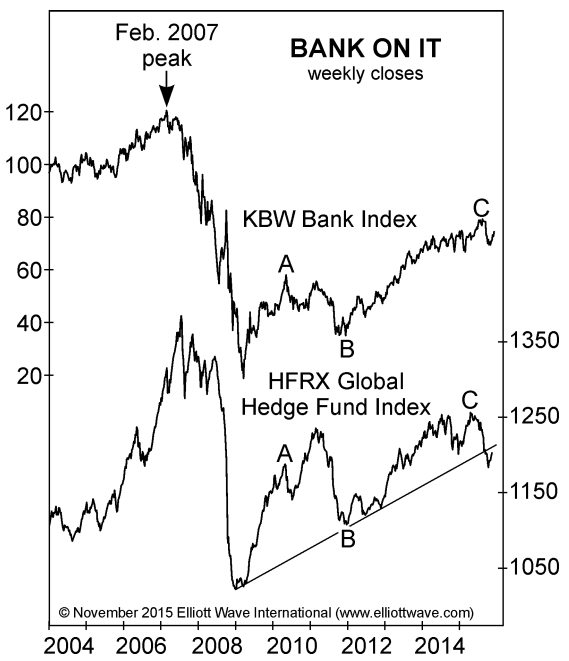 At a glance, you can see how similar the patterns are in these two financial sectors. Both indexes peaked in 2007, the year the financial crisis began. Both saw a rapid, precipitous decline into late 2008-early 2009. And, importantly, both sectors have moved up from those deep lows. But -- you can plainly see that at best, the "progress" has been weak and slow. Now, "weak and slow" is not what you expect to see in a bull market recovery. Instead, it IS what you expect to see in a three-wave correction -- or in Elliott Wave terms, an A-B-C correction. Specifically: These three waves are only correcting the larger, dominant downtrend. This chart is republished as part of a special, free report that we've just posted on elliottwave.com. This report includes other charts and major excerpts from our current issues of The Financial Forecast, and the European Financial Forecast. The charts & excerpts spell out the virtually unreported government actions that amount to a secret tax -- which is why the report's title is, "A Secret New Government Tax - Unveiled." This article was syndicated by Elliott Wave International and was originally published under the headline Why Not to "Bank" on It. EWI is the world's largest market forecasting firm. Its staff of full-time analysts led by Chartered Market Technician Robert Prechter provides 24-hour-a-day market analysis to institutional and private investors around the world.